Launch Tech USA has been named Mac Tools Vendor of the Year for 2011. The prestigious award was presented at this year's Mac Tools Tool Fair in Nashville, Tennessee, February 21. LAUNCH Tech USA today announced that it has been named “Mac Tools Vendor of the Year” for 2011. 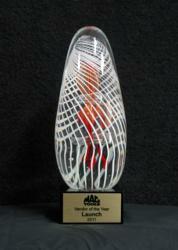 The prestigious award was presented at this year’s Mac Tools National Tool Fair in Nashville, TN. LAUNCH Tech USA received the highest form of recognition as a result of its top peer group ranking for field support, customer service, inventory turns, fill rate and on-time delivery. Launch Tech USA supplies Mac Tools with Diagnostics Equipment including Scan Tools, privately labeled Code Readers, and Fuel Injector Diagnostics & Cleaning Equipment. Launch Wheel Aligners are also privately labeled for Mac Tools. LAUNCH Tech USA, with parent company LAUNCH Ltd., are global leaders in the automotive diagnostics aftermarket. Launch manufacturers and distributes industry leading Automotive Diagnostics products, Undercar and Lift Equipment in over 60 countries worldwide since 1994. Mac Tools® is a leader in professional automotive and industrial tools and solutions. From hand tools, tool boxes and specialty items; to a full range of power tools, electronics and shop equipment, Mac Tools offers the solutions that meet professionals' ever changing needs to get the job done. The strong sales force of Mac Tools® Distributors and the same entrepreneurial business model that drives us today has powered Mac Tools® since 1938. Mac Tools® has been a part of Stanley Black & Decker since 1980. For more information, please visit http://www.mactools.com.